A perfect gift for every chocoholic! 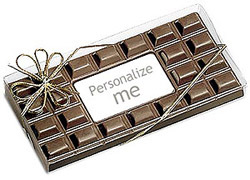 Get a digital image of your choice printed in edible inks on a rectangular surface on a luscious chocolate bar, measuring 8.5” x 4.25”. Our Chocolate Bar Card is perfect for all celebratory occasions, and also makes a great Thank You or holiday gift. Size : 8.5" x 4.25"